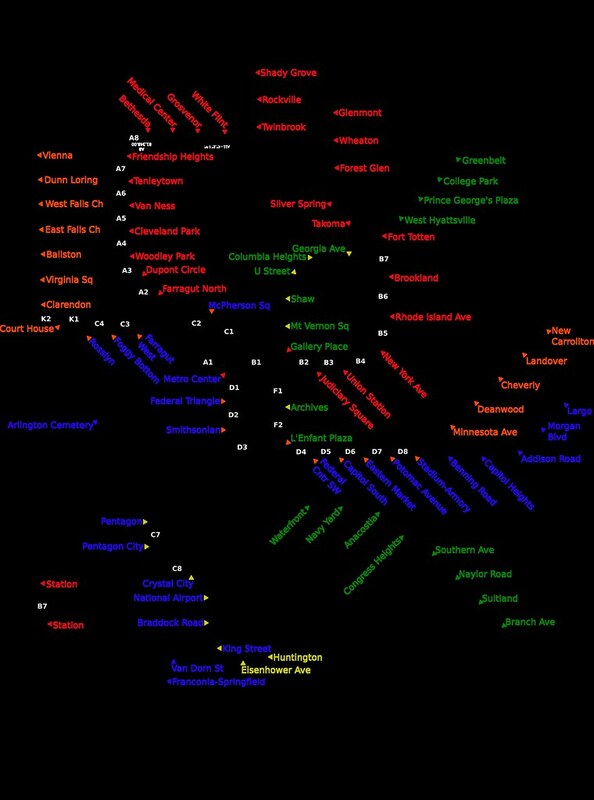 One favorite pastime of transit nerds everywhere is making fantasy maps. The Washington, D.C., area transit and development bloggers are no exception. The four most prominent designs are those created by Greater Greater Washington, Beyond D.C., TrackTwentyNine, and The Transport Politic (a blog which isn't strictly about DC.) GGW's plan extends all the way to the far side of Baltimore, which is reasonable considering how much of the area between the two cities has already been developed. An idea common to most of the plans is to build a new tunnel for Metro's Blue Line through downtown. It and the Orange Line currently merge at Rosslyn, and the tunnel under the Potomac River is one of the busiest sections of the system. In order to relieve the "Orange Crush" - which will only get worse when the Silver Line is completed - the current Blue Line would stop at a new set of platforms in Rosslyn. It would then go under the river to the west of the existing tunnel, and turn east under M Street in Georgetown. Early proposals for Metro included stops in Georgetown, but they were dropped due to geography. The new tunnel would then proceed under M Street through downtown, and by various paths proceed to cross the Orange Line again near RFK Stadium. The plans also attempt to deal with less immediate capacity crunch in the Yellow Line/Green Line joint tunnel between the junction under the Southwest Waterfront and Gallery Place, which is a transfer station for the Red Line. There's less agreement on what to do for this problem. Solutions include a constructing separate tunnel for the Yellow Line to the west of the existing tunnel, or constructing a entirely separate line from Alexandria into downtown. All of the plans have a significant shortcoming: they don't address the capacity issues on the Red Line, which is currently the busiest in the system. Union Station sees the greatest number of riders entering or leaving in the system because of transfers from Amtrak or the MARC and VRE commuter rail systems. Passengers switch to westbound Red Line trains to complete their journeys in the morning, and reverse the pattern in the afternoon and evening. The line also receives heavy ridership from the northwest (timetable west), though that is moving in the opposite direction. Below is my entry into the MetroRail expansion competition, which can also be seen in a slightly different form on GMaps. My plan includes the idea of having separate platforms in Rosslyn and a new tunnel into downtown, but differs from the others on where the tunnel should go on the other side. Instead of joining the existing path of the Blue Line east of the Anacostia, my proposed tunnel would split in two. One branch would join the Red Line north of Union Station, and the other would proceed south of Union Station, pass east of the Capitol, and join the Green Line just south of Navy Yard. This configuration would accomplish two things. One is it would free passenger capacity heading west from Union Station, and a lesser amount eastward from Dupont Circle. Most trains coming from the west end of the Red Line would terminate just north of Union Station, where ridership falls off significantly. The other is it would provide a path for north-south travel outside of downtown. Stations on the new line would be connected via tunnels to existing stations at Dupont Circle, Mt. Vernon Square, Union Station, Capital South, and Navy Yard. The currently proposed connection between Farragut West and Farragut North, and the one between the two major transfer stations at Metro Center and Gallery Place are also shown. One problem with building a new tunnel from Rosslyn through downtown is that it would potentially create a train throughput issue from the Pentagon on south to King Street. My solution here would be to once again keep the lines separate. In the short(er) term, trains could be simply turned at the Pentagon station, with a couple of extras kept on pocket tracks southwest of the station. But in the longer run, I propose that a new line be built from the Pentagon south to join up with the existing Blue Line near Van Dorn Street. While the I-395 corridor is certainly not urban and walkable, there has been considerable development along it. Areas of increased density include Shirlington, the Skyline area north of the highway between King Street and Seminary Road, and the Landmark/Cameron Station area. The current Van Dorn Street station is near the southern end of the built-up corridor, but it isn't easily accessed except by residences and offices immediately adjacent to it. 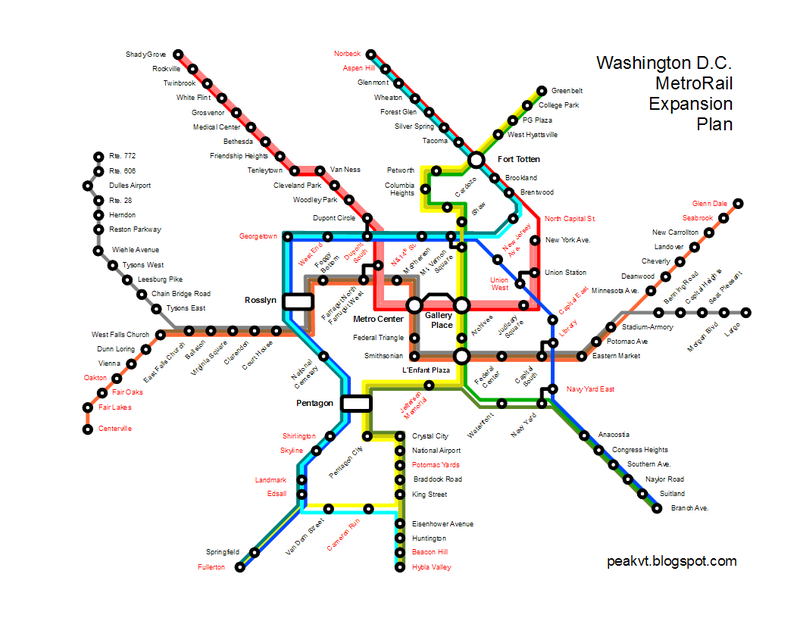 I propose stations at Shirlington, King Street, Seminary Road, Landmark Mall, and Edsall Road. The new line would be constructed with a mix of aerial structures and tunnels. The last piece necessary for my overall plan is a new connection between the Green and Yellow Lines south of L'Enfant Plaza. Currently, trains of the Green and Yellow varieties can only travel north at the junction under the Southwest Waterfront. I propose adding a new connection so that trains could travel from east to west and west to east at that location. Connections could potentially added at a few other locations, though the added flexibility might not really be all that useful in those instances. Close to downtown are two frequently discussed infill stations, one at Potomac Yards and another near the Jefferson Memorial. The former is already being planned. It potentially has great utility - if the NIMBYs in Alexandria allow enough density on their portion of the Potomac Yards site. Arlington County has already developed a high-density master plan for the area north of Four Mile Run, but that may not have good access to Metro if the new station is positioned too far south. The second new station would be a nice-to-have addition that would give tourists another point to access the system and give DC residents better access to East Potomac Park. A third infill station on Cameron Run between King Street and Van Dorn Street on the Blue Line is also shown, though I haven't studied it yet. Around the edges are some less important expansions. The Metro was planned to be more like a commuter railroad than an urban transit system, with long suburban extensions and widely spaced stations outside of downtown. I see no reason for fighting that history, so what I propose just extends the lines a little further to places that already have some amount of density. Both ends of the Orange Line, the southern end of the Yellow Line, the southern end of the Blue line, and the eastern end of the Red Line each receive from one to four new stations, pushing the termini out as much as 10 miles. The west end of the Red Line could potentially be expanded, but the route of least resistance would just duplicate MARC service. On the north and south ends of the Green Line, there is no particular place to go that would generate many trips. At the eastern end of the Blue Line in Largo there is a lot new construction, but it's not arranged in a way that could make use of an extension. The diagram above shows one potential service configuration on the newly expanded system. Each different line represents about a third of any one track segment's train capacity. I can imagine a few other arrangements, but this one seems the best for the traffic demand as I understand it. The names of new stations are in red. Labels: Maps, Transit, Washington D.C.
What I like about the GGW map specifically is that it does all the right things an S-Bahn should have: through-running, multiple downtown stations, good connections to the subway. Such a plan could, by itself, remove some crowding from the Red Line, since commuter rail riders would be able to connect to the subway at other points. Through-running conventional trains would certainly take some load off of the Red Line. The question is, of course, how much. If this map of ridership patterns is accurate, the answer is probably: not much at all on the west side, because there are so few Metro riders getting on or off at Rockville. In fairness, my proposal probably wouldn't take very many passengers off the west half of the Red Line, either. Better rail service would probably do more to take traffic off of the east end of the Red Line. I think it would mostly generate new trips, though. I try to make quasi-realistic plans when I do these things, which means not placing new lines or fully connected junctions everywhere. Compromises inevitably result, and even though I tried to address it, I think the Red Line would still be over capacity from Dupont to Gallery Place. I hope to do something more on the issue in the next version, whenever I get around to it.